The alveoli are the structural elements of the lung. During respiration this is where gas exchanges takes place between the blood and the alveolar air. In dentistry, the term alveolus is used to denote the dental alveoli. The alveoli have the form of small bubbles, which give the lung tissue, an overall sponge-like appearance. They are wrapped like vines around an alveolar duct (ductus alveolaris) to alveolar sacs (sacculi alveolares), which attach to the ends of the bronchioles. A single alveolus has a round to polygonal basic shape and has a diameter that is approx. 50–150 µm during expiration and up to 200–300 µm during inspiration. It is estimated that humans have between 300 and 400 million alveoli. This can vary interindividually. Together, they form a gas exchange surface area which is between 80 and 120 m2. 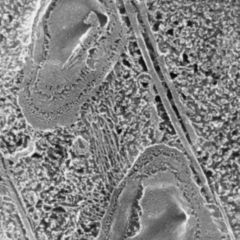 Adjacent alveoli are separated from each other by narrow alveolar septa, which are lined with alveolar epithelial cells (pneumocytes) on the luminal side. In the septa are fine pores, which interconnect the neighbouring alveoli (Pores of Kohn). cubic alveolar epithelial cells, also called type II pneumocytes, which produce surfactants an atelectasis factor. The alveoli also contain Clara cells, alveolar macrophages, which originate from the blood and phagocytise dust (dust cells) or absorb blood pigment after haemorrhaging (heart failure cells). Below the alveolar epithelium, sub-epithelial connective tissue is found in the alveolar septa. This is also referred to as “lung interstitium”. It contains numerous blood capillaries as well as fibroblasts, collagen fibres, elastic fibres, and proteoglycans. In the alveoli, gas exchange takes place between the respiratory air and the blood. Most of the alveoli are not ventilated at physical rest. 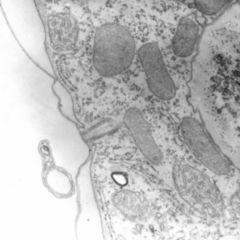 Through the von Euler-Liljestrand reflex, these reserve alveoli are also supplied with less blood. The entries to the reserve alveoli increase in size during physical exertion, intense laughter, or high fever, thereby increasing gas exchange capacity. 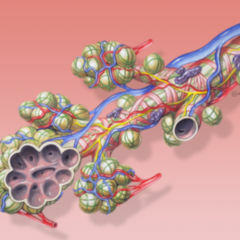 The alveoli are closely connected with the capillary system of the lungs. Both basal membranes are largely fused together. The alveolar epithelium is so thin that the respiratory gases oxygen and carbon dioxide can diffuse through it via osmotic forces. 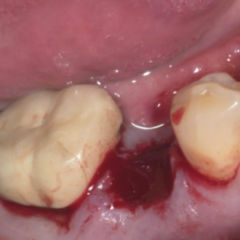 Because the Intercellular contacts of the capillary endothelium are more permeable to liquids than those of the alveolar cells, in the case of heart failure, fluid can leak into the connective and lead to interstitial oedema.